The BHS Intelligent Battery Organizing System is a cost-effective battery fleet management system that helps operators get the most out of a battery fleet. Choose from three models depending on your fleet size to improve efficiency and increase productivity. Battery room operators should strive for ideal charging conditions to get the best performance from their battery pool. 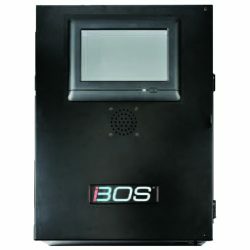 The iBOS® allows operators to quickly make data-driven decisions and identify problems with batteries and chargers. The iBOS® comes with a wide range of optional features. Wireless Displays mount directly on the charger control panel of battery extractors. Scrolling Displays feature an LED screen that tells operators which battery to select. The optional iBOS® World Web Service transmits information to an online user account so managers can view reports from anywhere. The iBOS® helps battery room managers make better decisions by giving them detailed information about their battery pool. Simplify battery fleet management with the Intelligent Battery Organizing System. Contact our sales team at 1.800.BHS.9500 to learn more about Battery Fleet Management products from BHS or to find a local dealer. Battery Fleet Controller transmits information to iBOS World Wide Server. Reports can be viewed anywhere by going to iBosworld.com.